Description: The subject is a clone of the original Shizu Onuma who was processed as the zoalord Griselda, who fell under a Chronos attack. The clone just like the original serves Agito and when he exchanged his standard Guyver unit for a Warrior Guyver Type 2 unit, she received not only his old unit but the Gigantic upgrade as well. Thus making her a powerful ally in the fight against Chronos. Psychological Profile: Subject has all of the memories and experience as the original. As such the subject has a subservient attitude especially towards Agito Makashima, allowing him to control her in any way he wishes. She has on occasion assisted the ACTF on missions without Agito’s permission as she has a hatred of Chronos herself. 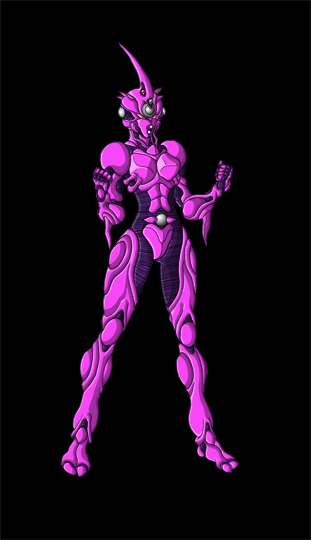 GIGANTIC UPGRADE: The subject received her Gigantic upgrade from Guyver 3 when he removed his original unit for a Warrior Type 2 unit. The Gigantic upgrade is identical to the original with all the same abilities. The upgrade responds to the subject’s will and at times can be willed to other Guyvers either by choice or by force of will. The powerful upgrade dramatically increases the subject’s base powers and increase his strength by several fold, it also adds additional abilities not shown in the subject’s unit. Such as able to project a powerful shield system capable of withstanding all but the most powerful attacks, addition of back thrusters for quick acceleration and attacks. The upgrade possesses power amps that greatly enhances the subject’s power channelling abilities which allow for additional powerful attacks. Present estimates of this unit type abilities have been compiled and summarized below. –Kinetic/Gravitational Momentum Organs: The unit has organs located on both forearms, and lower legs which allow the transfer of gravitational energy form the gravity control orb into these organs to allow the host to punch or kick harder than she normally would produce. This allows him to instantly boost his momentum by a factor of 10 as his mass is much lighter than it would be his proportion to this strength. The process is not automatic and must channel that energy himself. 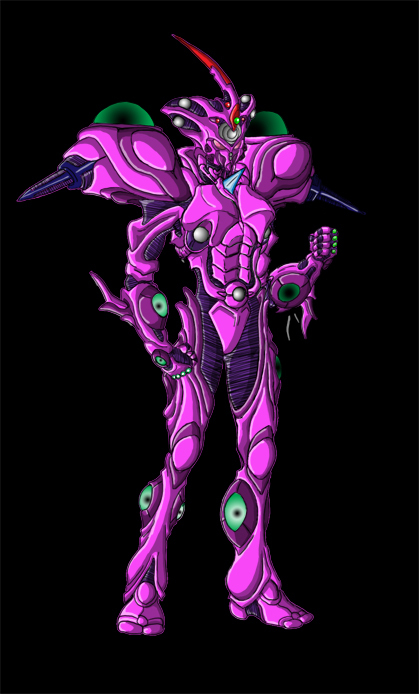 GIGANTIC UPGRADE: The subject received her Gigantic upgrade from Guyver 3 when he removed his original unit for a Warrior Type 2 unit. The Gigantic upgrade is identical to the original with all the same abilities. The upgrade responds to the subject’s will and at times can be willed to other Guyvers either by choice or by force of will. The powerful upgrade dramatically increases the subject’s base powers and increase his strength by several fold, it also adds additional abilities not shown in the subject’s unit. Such as able to project a powerful shield system capable of withstanding all but the most powerful attacks, addition of back thrusters for quick acceleration and attacks. The upgrade possesses power amps that greatly enhances the subject’s power channeling abilities which allow for addditional powerful attacks.